Even though Spring is on its way, the cold still seems to be creeping upon us. You want to keep your home warm and cozy during those colder days. In some rooms, this is easy. However, nearly every house has a room or two where this is a difficult task. It could be that there is a lack of vents, poor insulation or your central heat system simply does not reach that part of the house. What is the best and most economical way to warm these hard-to-heat recesses in your home? While you could re-configure the heating system in your home or in some cases improve the heat retention by adding or upgrading insulation, the easiest and often most affordable way to heat the colder rooms in your home is by utilizing portable heaters. Today’s portable heaters are more efficient, safer and easier to use than ever before. Type – Are you looking for spot heating to keep your feet warm while you work at your desk, or looking to warm an entire room? Do you have a semi-outdoor space like a garage or covered deck you want to heat? Each of these situations call for a different type of space heater. Discover the different types available and choose one that serves your needs best. 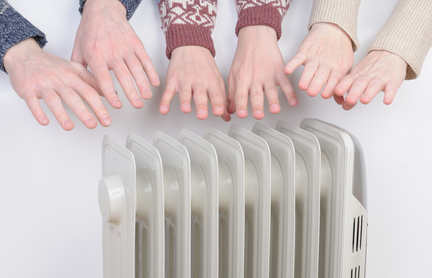 Safety – Look for a heater where the hot surfaces are completely out of reach. Additionally, make certain the heater includes features that will shut off a heater that overheats or tips over. A plug with ground-fault protection is another excellent feature. Efficiency – If you plan to use it often, you want to choose a portable heater that will not wreak havoc on your electric bill. Models with a fan will heat larger areas with ease—likely for a lower overall cost. Size – Consider the size of the space you are looking to keep warm and choose the smallest size that will adequately heat the space. Too large of a heater will simply waste electricity, and too small of a model will leave you wanting more. As you can see, there are many solutions for warming that not-so-cozy space in your home. Put some thought into your decision making process and soon you’ll be able to enjoy ALL of your home—even in the depths of winter.